﻿ Cosmetic Tube Packaging - Just Polyethylene Tubes. Plastic tube packaging is a popular and gowing packaging sector due to the unique benifits that it brings over other packaging solutions. Plastic tubes do not require additional outer carton packaging and the material is flexible whilst retaining it's shape so can withstand the rigours of transportaion and handling. The tubes stand upright on the cap allowing easy point of sale product display and easy hygienic dispensing. The durable nature and size of the plastic tubes means they are great for use in many environments from the bathroom to the beach to the workshop. 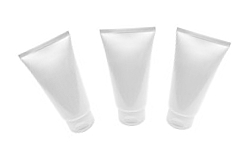 Plastic tube packaging are used extensively in the Cosmetic industry for a range of creams, lotions, gels and shampoo's.The are also used in pharmaceutical, Animal cosmetic and hotel cosmetic industries.